PAN India 3G service provider, Bharat Sanchar Nigam Limited (BSNL) plans to launch a new e-wallet App 'State Bank MobiCash' in association with SBI and Trio tech for both smartphone and feature phone users in all the circles. BSNL launched this new Mobile Wallet App for customers in 4 Circles - Punjab, Rajasthan, Haryana and Bihar on 17th December 2016. As per the latest information, BSNL plans to launch 'State Bank MobiCash' e-wallet App in all other circles by the end of December 2016. 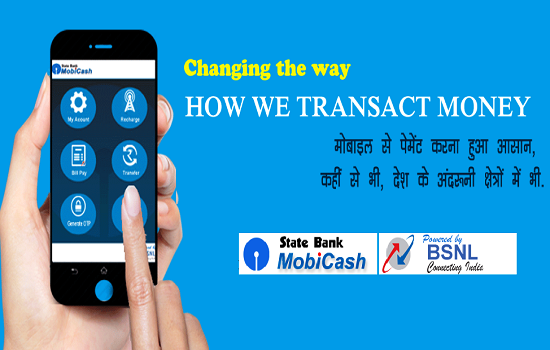 State Bank MobiCash e-wallet service offers facilities like fund transfer, mobile recharge (BSNL Prepaid), bill payment (BSNL landline and Postpaid), balance enquiry and mini statement. The wallet service is available through Smartphone Application (for Android users & I-phone users), USSD shot code (Dial *511#), Call or SMS (51516 for BSNL users & 94 183 99 999 for mobile users of other operators). A mobile wallet is virtual wallet, where you preload a certain amount in your account created with the mobile wallet service provider, and spend it at online and offline merchants. For example, if you go to a coffee shop A, which is listed with MobiCash mobile wallet, you can pay for your coffee through the mObiCash mobile wallet in the phone. Using MobiCash App / SMS / USSD etc. A mobile wallet by State Bank of India in Partnership with BSNL. Two most Trusted PSU’S of India (BSNL & SBI) catering to deepest Rural Indian Population. MobiCash provides Cash-In & Cash-Out Facility for masses, not available in other mobile wallets in the market today. Backed by huge BSNL Retail Network across the country as extension Bank Counters. MobiCash is a user friendly, Reliable & Secured mobile wallet App. Instant money transfer instantly in a most secured manner for Electricity and other utility payments. No need to carry Cash as it is dangerous at times, can use mObiCash easily on any phone even without internet. Easy tracking & can reconcile expenses and budget the same. MobiCash is a mobile Wallet for Unbanked Population as well, no need to have Bank a/c. Dear readers, please share your views and opinions about BSNL's new e-wallet service 'State Bank MobiCash' via comments with us.